Here is the third generation Camaro for a picky buyer. This car is CLEAN. 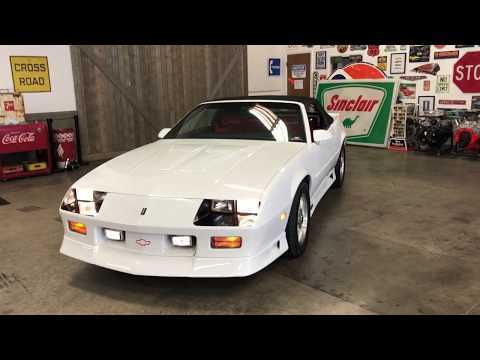 Over 100,000 Camaros were produced in 1991 but only 3,203 of those were convertible Z28's. This particular one was a very unique, well equipped, highly optioned special order unit. The color combination is outstanding and the car was ordered with B84 Ornamentation Body Moldings and B18 Ornamentation Deluxe Interior! The car appears to remain true to its original form with no signs of paint work or previous damage. The car was meticulously garage kept by both of its owners and some of the factory stickers are still visible on the suspension components. This is one car that truly looks as phenomenal in person as it does in photos. With just over 32k miles and this condition, you can own a very nice investment quality Camaro! Below is a breakdown of every RPO code associated with the special order of this car.